Developed & published by Telltale Games. 1 player offline, or online via CrowdPlay. Released August 2nd, 2016. Rated M for Mature. Full disclosure: I'm not a big Batguy fan. I don't hate the character despite the DC origins, but I do dislike the way he is usually portrayed in the more popular incarnations. The few Batman stories I've really enjoyed tended to be the extended universe, non-canon and/or generally peculiar ones, like Knightfall, Batman vs Predator and some graphic novel where Bruce Wayne fights vampires and eventually becomes one that Alfred has to kill. The deal with Telltale adventure-style games of the last and current generation is that you are given a lot of choices. A few are bigger than others and, while the overall stories don't change, the dialog or actions you choose can affect the tone. Realm of Shadows is the first episode of five in this new Batman story, and the best aspect is that you can play Bruce Wayne/Batman as the self-righteous goldenboy hero from the classic stories, or as a bitter, vengeful vigilante, or a blend of the two. 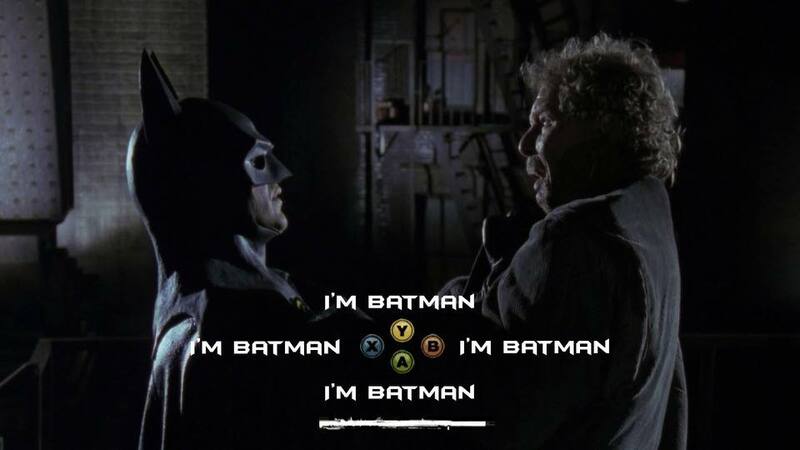 Batman games usually involve a lot of combat and a bit of detective work, and this game is no exception. The action is all QuickTime Events, though, and the detective set-pieces are more busywork than they are genuine puzzles of any sort. This particular game adds a third element which is managing relationships & reacting to events (mostly as Bruce Wayne) and does a great job selling the illusion of steering the narrative and creating interest in characters and moments that could easily be boring as all hell. The good news here is that the Telltale game engine is running smoother & looking better than ever before. I didn't experience the expected choppy framerates and stuttering animations even during heavy action scenes & achievements popping, and this has the nicest overall visuals of all the TT titles so far, although the art style is relatively simple. The voice acting is above average if not great, and the music & sound effects are adequate and mostly unremarkable. The bad news is that all the choices are still mostly illusion, as the major plot beats are going to occur no matter what you say or do, and the twitchy QTEs that make up most of the action moments still won't win over people that haven't enjoyed any previous Telltale games. There are a few moments in this game that are unique to this title, such as a part near the end of this episode where you choose what order Bats takes out the bad guys in, and what methods he uses, then get to watch it play out. I'm giving Batman: The Telltale Series episode 1 an 8 out of 10, because it managed to get me interested in the character and presented story I was not expecting to like, nicely changing up its own pace a couple times and setting up enough intrigue that I am sold on buying episode 2. It loses a couple points because there are too freaking many short, pointless QTEs in action scenes that could use some trimming down. My play time from start to finish was about 5 minutes shy of 2 hours. If you are a fan of Batman and/or other Telltale games, then I can confidently recommend that you lay down the $5 and get episode 1 of this. If you aren't a fan of these games' style and don't have a particular love for the character, this game will most likely not change your mind on either. You will get all 6 achievements for 200G just by playing through--nothing extra needs to be done and you don't even need to be thorough in examining objects. I am with you Meta, not a fan. This is one of those games I will pick up if it's on sale though. I am hoping that once the rest of the game is out, Telltale will do like they did with their other games and make episode 1 free. Currently, if you just buy the entire game upfront you are still paying the full price, $5 per episode, so it will be $25. Even if you decide to buy episode 1, I would definitely recommend to everyone that you wait to purchase the others, as there will probably be a discount later and very likely a sale at some point. Since it's only $25 for all 5 episodes, they may even make this free eventually, although I would wager that Walking Dead season 2 or the Borderlands TT game would be free GwG first. No worries I can wait. Also folks, they will be releasing a disc version with all episodes in mid-September, so keep an eye out for a used copy after that. You could easily complete this within 7 days and return it for a full refund. So I finally found a used copy to "rent", and I enjoyed episodes 2-5 a lot. The story ramps up nicely during ep 3, and a nice plot twist and the appearance of a couple major characters keep interest up. The ending of episode 5 wasn't great, but it also wasn't terrible. It resolves the current conflicts well enough, while also setting up for a possible second season of episodes. If you liked episode 1, or are a fan of Batman and/or Telltale games in general, I definitely suggest you find a way to get your hands on this. It is also a simple 1000G that doesn't require any special effort and has no collectibles. Total playtime will be around 8 hours.